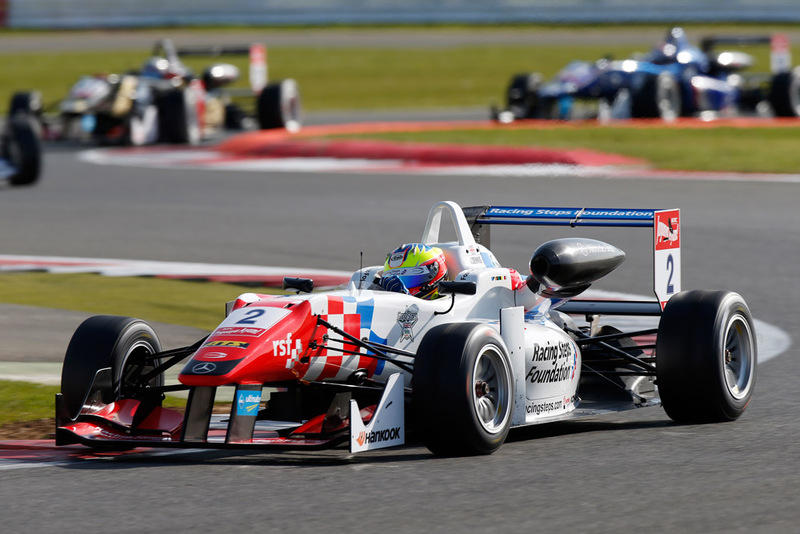 Jake Dennis's hopes of claiming a second podium in race two of the opening round of the European Formula 3 Championship at Silverstone were dashed the moment the lights went out. The Racing Steps driver stalled on the grid dropping from sixth to 15th before battling back into the points with a lap to go. But a final move to relieve West-Tec's Fabian Schiller of ninth at Club left him pointless and out of the running. Having cut back and taken the inside line into the turn, the pair came together as the German moved across forcing Dennis off-track and into retirement with a broken left rear wheel. Schiller continued to finish 11th. "It wasn't the best of races for me, that's for sure," said Dennis. "I had a problem with the clutch at the start which led to the stall and then just as I'd made my way into the points I got taken out." Carlin rookie George Russell secured the win just under two seconds clear of Van Amersfoort's poleman Charles Leclerc. The pair, who had clashed at the start of race one, were involved in a three-abreast tussle with Carlin's Antonio Giovinazzi at the start, with Leclerc losing out to the Brit and the Italian latching on behind. Despite an almost instant safety car - due a lower order collision - the die was set with the trio holding position at the restart and racing line astern to the finish. The 'most meteoric drive' award went to Dennis's Prema team-mate Felix Rosenqvist who climbed from 35th on the grid to seventh. The race one victor - and initial triple pole winner - had been relegated to the back of the grid for races two and three due to an adjudged bodywork infringement in second qualifying.